We produce a range of kits with varying degrees of difficulty, so there's always a fresh challenge. The kits usually contain everything you need to complete the project, except for the tools. Each kit lists the extra tools you will need. Round nose pliers, flat nose pliers and wire cutters are the basic tools to make jewellery and we supply them as well. In sets or individually, at a range of prices. 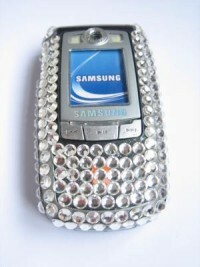 The image shows a phone that has been given our 'bling' treatment from out 'bling your phone' kit. We currently supply a number of kits for bracelets, necklaces and even a 'bling ring' kit. Contact us for more details - see the ordering link page for our e-mail address - our address and phone numbers are below.